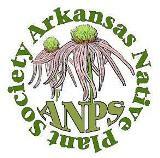 On Friday October 12th, the community of Dardanelle was invaded by Arkansas Native Plant Society (ANPS) members. Fifty or so ANPS members made it to the Lake Dardanelle State Park facilities in Russellville. They came for ANPS business, for education and for fun. The featured event on Friday was the annual ANPS Plant Auction. Proceeds from the auction fund scholarships and grants as do the sales of ANPS T-Shirts. Members were encouraged to bring pot-luck snacks so everyone could carbo-load, mingle and sign up for Saturday field trips before the bidding began around 7:00 pm. Eric Sundell and MaryAnn King served as auctioneers for the evening. For sale were a huge number of plants and plant related items. MaryAnn and Eric must have had a stash of Ricola lozenges at hand to prevent them from losing their voices. At 10:00pm on the dot, the auction was over and it was time to straighten up and then go get some rest before Saturday’s field trips. Oddly enough, the good people at the Hampton Inn did not bat an eye when a host of guests headed back to their rooms with an armload (or two) of plants. On Saturday, attendees had the opportunity to take several different field trips. 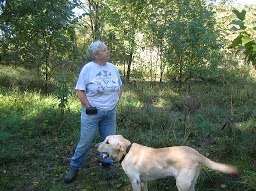 Burnetta Hinterthuer led the walk on the Bona Dea Trails. Brent Baker led a morning walk on the Summit trail at Mt. Nebo and an afternoon walk down the Nebo Springs Trail. Larry Price led an extended hike at Long Pool (in the Boston Mountains) that covered the morning and afternoon. Dardanelle’s Trees of Distinction was another of the afternoon options. Mike and Peggy Burns led this tour, which includes the North American Champion persimmon. After a day of hiking, we headed back to the Dardanelle State Park to hold our Membership Meeting. Before we got down to business, Burnetta Hinterthuer gave a beautiful and informative presentation on the Flora of Costa Rica. New officers were presented for confirmation by the membership. 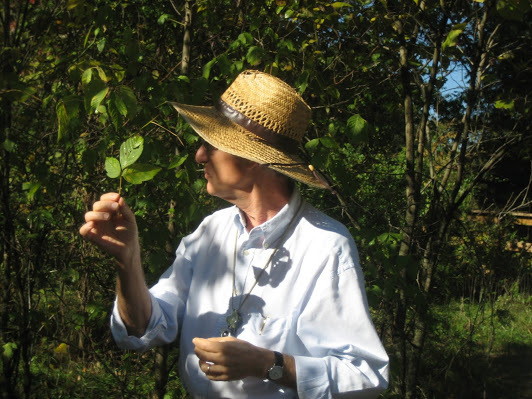 A grant was approved to provide funds for purchase of native plants for a new native plant garden at the Logan County Museum. On Sunday, several gathered at Pine Ridge Gardens (near London, AR) to take a walking tour through MaryAnn King’s arboretum. Eric Sundell and MaryAnn played a cat and mouse game of What Tree is This? Eric proved his scholarly mettle by meeting all MaryAnn’s challenges. Some of the highlights of the arboretum included a toothache tree, Zanthoxylum clava-herculis and a cucumber magnolia, Magnolia acuminata. MaryAnn and her dog Candy seemed a little protective of the magnolia, so Eric did not ask us to chew it. After the arboretum, many members browsed the plants at the nursery and even took a few of MaryAnn’s babies back to new homes. Special thanks to Mike and Peggy Burns for making arrangements for this event. Outgoing president Sandy Davies also spent lots of time preparing, so a big thanks goes out to her too. Our next ANPS meeting (Spring 2013) will be held at Subiaco’s Coury House Retreat Center the weekend of April 26-28th. Come and join us for all the fun. The Fall 2013 Meeting is expected to be scheduled for the weekend of Oct. 11-13th at the Ozark Folk Center in Mountain View. Details will be posted soon. Gallery | This entry was posted in Chapter Meetings and tagged Arkansas Native Plant Society, plant auction. Bookmark the permalink.